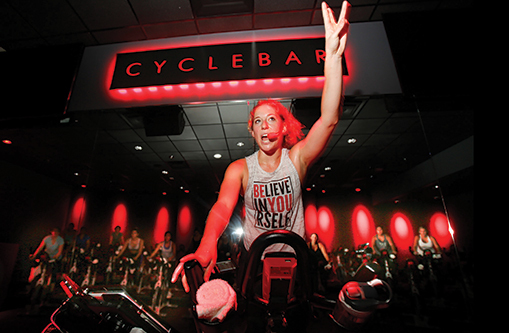 A workout doesn’t count unless you sweat, and sweat you will in Cyclebar’s Falls Church and Columbia Pike studios. Riders’ stats are projected on a leaderboard (you can opt out if you want), and a digital readout on your bike accurately gauges your effort level, with reports emailed to each cyclist after class. Loyal attendees tout the excellent music selection (playlists are shared at cyclebar.com/info/cyclebeats), great teachers and motivating biofeedback technology. “The leaderboard and the digital readout keep you honest,” says one fan. “When the instructor tells you to reach down and put more resistance on your bike, you can’t fake it.” Online booking and check-in (where your rental shoes are waiting for you!) make it super-easy to breeze in and out of class. The hard part is what happens in between.